Cap or plug openings to prevent fluid from spilling. Remove the front drive shaft (RH/LH). Refer to FAX-21, "6M/T : Removal and Installation (RH)"(RH), FAX- 18, "6M/T : Removal and Installation (LH)"(LH) and FAX-26, "EXCEPT 6M/T : Removal and Installation" (Except 6M/T). Use oil seal remover or a similar means and remove the differential side oil seal. When removing the differential side oil seal, be careful not to scratch the oil seal mounting surfaces of the transaxle case and converter housing. Do not reuse differential side oil seal. Apply Genuine NISSAN CVT Fluid NS-3 to the differential side oil seal lip and around the oil seal. Using Tool, drive the differential side oil seal in until the amount of oil seal projection from the case edge matches dimensions (C) and (D). Be careful not to scratch the lip of the differential side oil seal when press-fitting it. Dimension вЂњCвЂќ :Height difference from case end surface is within 1.8 В± 0.5 mm (0.071 В± 0.020 in). Dimension вЂњDвЂќ :Height difference from case end surface is within 1.8 В± 0.5 mm (0.071 В± 0.020 in). 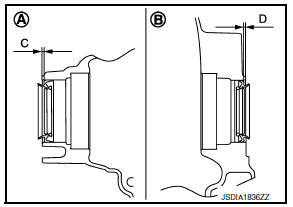 The reference is the pull-in direction of the differential side oil seal. Drive the vehicle and check visually that there is no leakage of CVT fluid.